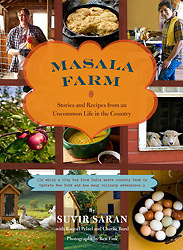 And then there are about 80 delicious recipes slated into spring, summer, fall and winter with an intro by Saran to each season. Here are two of the recipes reproduced from the book with permission from the publisher. These homemade fries are absolutely worth the time and effort it takes to make them. Panditji, my parents’ cook, always made them for my brother and I on days when we had cricket practice. He knew we’d invade the house with our teammates, all of us ravenous. We’d keep devouring these fries, which are flavored with a spice blend called chaat masala that is at once salty and savory and wonderful, until he ran through as many potatoes as he could possibly have in the house—often up to twenty pounds! Potatoes are easy to keep around the house, making this snack convenient. In Hindi, chaat means “to lick,” referring to the mouth-watering appeal of the spice blend and the genre of chaats, an appetizerlike dish consisting of opposing textures, temperatures, and flavors. Chaat Masala is integral to chaat and is perhaps my favorite Indian seasoning. I use it to finish these fries and to sprinkle on just about anything, from grilled corn to roasted sweet potatoes. Peel the potatoes and slice them lengthwise into 1/3-inch-/2.5-cm-thick planks. Slice each plank into 1/3-inch-/2.5-cm-wide sticks. As you’re slicing the potatoes, place them in a large bowl of ice water so that they don’t oxidize and discolor. Mix the chaat masala, cayenne, salt, and pepper in a small bowl and set aside. While you peel the potatoes, slowly heat the oil to 275°F/135°C/gas 1 in a wok or saucepan (you should have at least 2 inches/5 cm of oil in the pan). Place a kitchen towel on your worksurface and lift about 1/3 of the potatoes out of the bowl, shaking off as much of the excess water as possible. Place them on the kitchen towel to drain, blotting the potatoes dry as best as you can (an extra towel and paper towels/absorbent paper may come in handy). Heat the oven to 250°F/120°C/gas 1/2. Drop the first batch of potatoes into the hot oil, reduce the heat to medium, and using a frying spider or slotted spoon turn the potatoes often so that they cook evenly. Once the temperature of the oil dips to 250°F/120°C/gas 1/2, after 5 to 7 minutes, increase the heat to medium-high and cook the potatoes until they become golden brown, about 7 minutes more. Transfer the fries to a paper towel–/absorbent paper–lined plate to drain and then place on a rimmed baking sheet/tray. Sprinkle with 1/3 spice mixture and keep them warm in the oven while you cook the remaining potatoes in batches. Serve immediately. Throughout the Southern states of America, black-eyed peas are served for good luck on New Year’s Day. They’re excellent with stir-fried cabbage—also considered a good-luck food, since it supposedly represents folded currency—and rice, of course (in the South, this dish would be called Hoppin’ John). In India, my family’s recipe for rongee, Hindi for “black-eyed peas,” is just as tasty. I often make it for our grand New Year’s Eve celebration, happily knowing that the dish will probably be outshined by its fancier table competition, like crown roast of pork, Masala Chateaubriand or a biryani rice dish. We pull out the good china and the sparkling stemware, load the wine cabinet with bubbly, and trim the house with glittering baubles, like three-foot-tall glass hurricanes filled with beautiful colored glass and twinkling holiday lights strung around the mantle and into antique bird cages. Our holiday tree (purchased from Gardenworks) is lavished with ornaments collected from around the world. It is a night we all look forward to with great anticipation all year long, and any leftovers make New Year’s Day that much tastier! 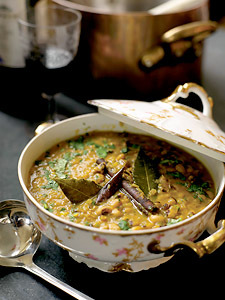 Heat the oil with the cardamom, cloves, chiles, bay leaves, cinnamon, black pepper, and cumin seeds in a large heavy-bottomed pot over medium-high heat until the spices are fragrant, 1 to 2 minutes. Stir in the ginger and cook until it becomes fragrant and sticky, about 1 minute. Add the onion and salt, and cook, stirring often, until the onion turns deeply browned and sticky, 15 to 20 minutes. If the onion begins to stick to the bottom of the pot or begins to burn, reduce the heat to medium and splash the pan with a few tablespoons of water, scraping up the browned bits and stirring them into the onion. While the onion browns, place the tomatoes in a blender or food processor and purée until they are completely smooth. Set aside. Stir in the garlic and cook until fragrant, 30 seconds to 1 minute, and then add the coriander, ground cumin, and turmeric, cooking until they begin to smell toasty, about 30 seconds. Stir in the cayenne pepper and 2 tbsp of the yogurt. Cook until heated through, about 1 minute, and then add the remaining 2 tbsp yogurt. Continue to stir and cook the yogurt and spices until the contents of the pot are thick and sticky and the liquid from the yogurt has evaporated, about 2 minutes. Stir in the tomato purée and bring to a boil. Reduce the heat to medium-low and cook until a film of oil pools on the surface of the sauce, 6 to 8 minutes. Stir the black-eyed peas, garam masala, and water into the tomato mixture. Increase the heat to medium and cook, stirring often, until a bubble or two breaks at the surface, 5 to 7 minutes. Season with salt and add more if necessary. Serve hot.